Are you heading Saxony way on a Bach pilgrimage? As our musical map suggests, there's more to Leipzig than just organs and fugues. It was the musical centre of Germany for years, its buildings have housed many of the great composers, and it gives us one of today's finest orchestras. 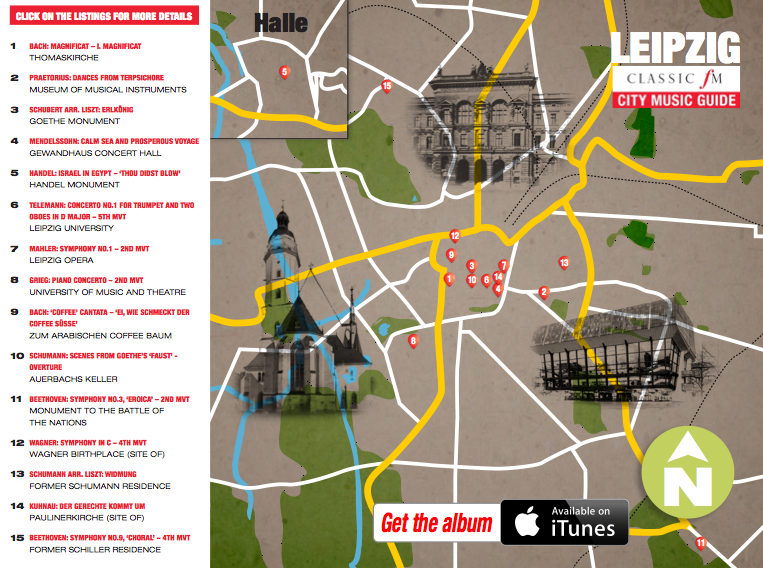 To accompany our new download collection we present this guide to Leipzig's musical streets and rich cultural history. Hear the famous Gewandhaus orchestra, walk with the ghosts of Schumann and Mendelssohn, then get all poetical with important Shiller and Goethe sites. And (of course) there's Bach. Lots of Bach from the churches he composed and performed in, to the riches at the Bach-Archiv. Grab those dusty Bach scores, pour yourself some strong coffee, locate St Thomas’s Church, and get ready to indulge in the music this incredible historical centre. Click on the image below for the full map.